Back in the early 80s when bands like Iron Maiden and Judas Priest had just cemented themselves globally as huge stars, the heavy metal scene in Finland was very much in an infant-stage. One of the notable bands that was at least not lacking in attitude was Purgatory, founded by brothers Marco on bass and vocals and Zachary Hietala on guitar. Yes, I have often wondered if they had traded tapes with a young American headbanger who had founded a similarly named band in Florida around the same time…what’s his name again…oh yeah, Jon Schaffer. Anyhoo, before charging in to cut their first album, the brothers changed their group’s name to Tarot, also consisting of second guitarist Mako H. and drummer Pecu Cinnari. In 1986 they released their debut album, Spell Of Iron. While not setting the world or even their home country on fire, they enjoyed moderate success over here and made a pioneering statement. A serious, high-quality metal band from Finland was really an oddball idea back in those days and Tarot, complete with their big, BIG hair, zebra-pattern spandex-clad promo shots and huge stacks of Marshalls, decided to be one of the first to show up any doubters. The opening tune, Midwinter Nights, starts with a very Dio-esque wind effect before crunching out with searing guitar and Marco’s soaring voice. Those who have gotten better acquainted with the might of his pipes through Sinergy and Nightwish, might consider the early Tarot-albums a bit “unrefined” as far as his singing goes, but for a 20-year old kid making his first major recording, he is a monster. Sure he would get a lot better even before spreading his voice outside the Tarot-camp, but based just on this record, one could easily think of him as Finland’s Ronnie James Dio-in-the-making. After a punchy opening, the slightly more mid-paced Dancing On The Wire is probably my only choice for a mediocre tune on this album. Fortunately the following streak of speedy rockers: Back In The Fire, Love’s Not Made For My Kind, Never Forever and the title track all boast scorching solos and catchy choruses with fist-pumping action galore. Make no mistake, while they might have looked like tons of bands from the Sunset Strip, their sound and themes were a lot more heavy and aggressive then any poodle band from Hollywood could've mustered. Some of the pacing and phrasing of the lyrics might sound a bit silly to native speakers, but as it was even rarer back then than today that Finnish bands would have a singer who could not only pronounce any English but sound divine while doing so, I really can’t criticize Marco for that. De Mortui Nil Nisi Bene is a nifty little instrumental in the middle to precede another powerful hairspinner in Pharao. This tune includes a very amusing little detail which pokes fun at the contemporary allegations of metal bands hiding subliminal messages in their songs. During the song, there is a short section of apparent gibberish which played backwards says “I knew you would listen to this backwards, you pervert!” in Finnish. Big points for that one. The following fan favourite, Wings Of Darkness, is pretty much Tarot’s equivalent of Number Of The Beast or Breaking The Law i.e. their biggest, most recognized song. The album is closed by the lone slow track on the album, Things That Crawl At Night, which is nothing short of spectacular – A really dark and ominous ballad where Marco does his best singing on the disc. The 2006-reissue of the album has seven pretty good bonus tracks, including blazing live renditions of Back In The Fire and Love’s Not Made For My Kind. The demo versions of I Don’t Care Anymore, Lady Deceiver and Blood Runs Cold, three tracks that would come out on their second album, Follow Me Into Madness, are also very intriguing for slightly bigger fans. One of my favourite sections on this site is the classics-portion and if I were to talk about such records from a purely nationalistic perspective, Spell Of Iron would be the be-all-end-all Finnish CLASSIC. 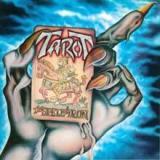 It’s not my personal favourite Tarot-album but a damn good one and an undeniably pioneering piece of work. In my humble opinion, a metal record with such a combination of technical chops, songwriting skills and crisp production values had never before been made here. Even though the band hasn’t always gotten the credit they deserve, I consider them the first masters of Finnish metal who many, many groups would follow in their own ways.